One of the best things you can do for your writing, as most of us already know, is to read. Not only should you read authors you already admire, it’s a good idea to read authors you’re not familiar with. Ask friends (not the ones who read dime store novels) for recommendations, read reviews, join Goodreads…. Contrary to popular belief, “the news of …[publishing’s] demise has been greatly exaggerated.”** Books are everywhere! Now I’m not suggesting that you just curl up under the covers or in a sunny chair and lose yourself in a book. I’m suggesting you look critically at the way the author put words to paper to create something that resonates (or not) with you. How do the transitions work? What about the pacing, the ratio of scene to exposition and reflection? Look at the plot, what is the inciting incident? What does the character want? What is in his/her way? Are the obstacles formidable? Are the obstacles believable? I’ve been reading books, specifically memoirs, that deal with grief, looking at how other authors write about their loss. 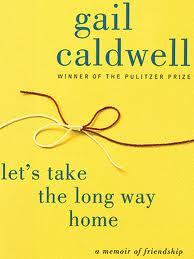 I’ve found that it is a challenge, to write about it deeply and authentically, but without overdramatizing– like Gail Caldwell’s Let’s Take the Long Way Home. I appreciated the way she ended each chapter with a reflection on the events. I marveled at Joan Didion’s prose style in The Year of Magical Thinking. 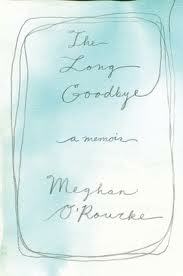 I also read Megan O’Rourke’s The Long Goodbye which was not my favorite–her writing seemed to move away into the personal, and delve more into the research, the psychology of grief and the tone shift didn’t engage me. 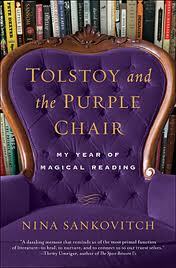 On a whim I picked up Tolstoy and the Purple Chair, by Nina Sankovitch. I loved the idea of reading her way through grief after she lost her sister. Sankovitch did a fantastic job of connecting the books, the story lines and characters, to her own life… but to me, she didn’t think deeply enough on the page, about her grief, for me. And, because my committee chair / adviser suggested I need to work on pacing, and should re-read Tobias Wolff’s This Boy’s Life I am working on that now…. What I’ve always admired about this memoir is Wolff’s elegant way of writing what Philip Lopate calls the “double narrative.” What the narrator thought then and what the narrator thinks now. Wolff can even do this on several levels– what he thought then, what he thought years later, and what he thinks now, a kind of triple narrative! It’s impressive. Now I am looking at the pacing, how he moves in and out of scenes, the ratio of scene to exposition to reflection. You don’t necessarily need to read books that explore the same subjects you’re dealing with (though it is good to know your market, and your competition), reading critically can be a great way to stimulate your own writing. What books do you look to for inspiration? for narrative structure? for voice? When I was dissertating, I kept at my side Ann Patchett’s Magician’s Assistant & Taft, and filled my prose with Michael Cunningham’s By Nightfall. Thanks for the post, Jenn! Good post, Jenn. I’ve been a reading maniac lately and keeping in mind what authors are doing that i admire. I just read Neil Gaiman’s Stardust and took note of how he summarized time. He needed to convey that 2 weeks had passed during an adventure, so in one paragraph, he listed a series of events using specific details that conveyed the bare bones outlines of several anecdotes he didn’t expand on–sometimes making the anecdotes mere clauses within longer sentences. By the end of the paragraph, he’d really conveyed a full 2 week adventure by his use of specific details–details about characters met in passing, conflicts overcome, etc, and the reader understood how the main characters had changed during the journey. I have it mind to give myself a writing exercise doing the same thing. Now I’m reading Louise Erdrich’s The Master Butchers Singing Club, which makes me ache from how beautifully it’s written. That book is sort of frustrating, because it makes it impossible to ignore that writing can be this deep and quickly exact. I read more and then look at my own revisions, upping the ante even higher. My god though, she’s ridiculously amazing. Dawn, I can’t believe it took me this long, but I joined the Louise Erdrich fanclub a few months ago. She’s absolutely brilliant, but it’s never a hey-lookie-what-I-can-do kind of brilliance. I’ve got The Antelope Wife up next.